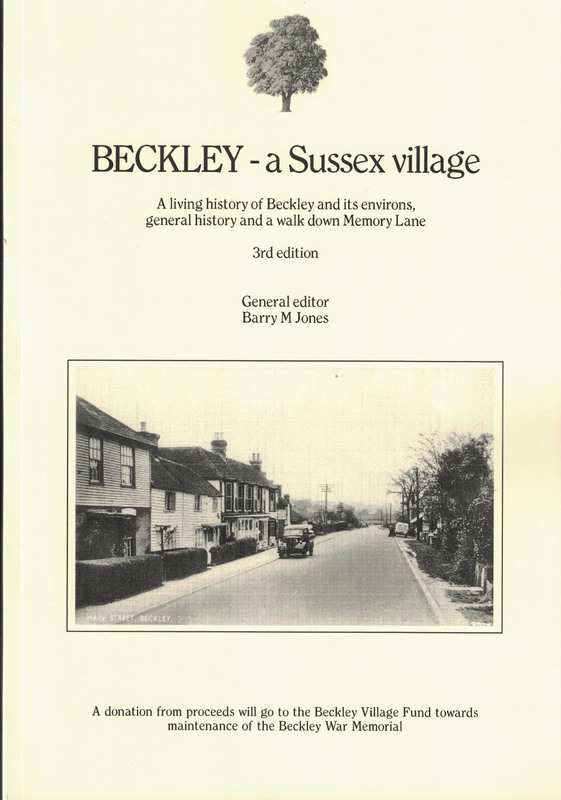 "Beckley - a Sussex village" - The history of Beckley and its environs. There are three villages in England named Beckley - a palatial village on the Roman road north of Oxford; a hamlet in Hampshire near the New Forest and our rural village in wooded East Sussex. That in West Virginia, America, although an early British colony, is named after a General Alfred Bickley, while the industrial Beckley Furnace in Connecticut is named after a John Adam Beckley. Neither are named after our village. Mind you, our Beckley is a relatively modern spelling for it was originally 'Beccanlea' (Becca's clearing... though who Becca was is another matter). It is recorded as the phonetic 'Beccalia' in the 12th century, 'Becheleya' in the 13th and 'Bekeles' in the 14th. The eastern hamlet of Four Oaks was once Bromenesmythe (14th century), Brownsmyths Oaks by the 18th by when it was also known locally as Beckley Corner, or from the late-18th century, Four Oaks... but why only four oaks? The area was certainly an active iron-smelting area in pre-historic times, hidden deep in the Andreas Wald forest, and continued to be under the Romans but died under the Saxons only to be resurrected in the 16th century producing cannon and shot for the King. It is mainly through the iron industry that so much of our irreplaceable ancient woodland has survived through coppicing for charcoal - and more recently hop poles. Beckley village, as we now know it, however first comes to light as a royal hunting estate near the iron workings, as Beccanlea, left in King Alfred's will of 901AD. It is however later identified as the Domesday manor of Glesham. Beckley village sometime thereafter slowly evolved as a parish comprised of a handful of manors, such as Knelle, covering much of neighbouring Northiam, or Brownsmyth covering parts of Peasmarsh but these historic manors had all but disappeared by the Great War. This comprehensive, 400-page cornucopia is a readable history for all, as opposed to an academic thesis, whetting the appetite by covering all aspects of village life and the several imponderables from the influence of its two rivers (and of Rye's harbour); the 'harvest' reaped from the land (iron-smelting, bricks, timber, agriculture); the influence from its invaders - the Romans, Saxons, Normans to today's commuting 'furriners'! ; its roads and parish constables; the social structure from the Church, the Workhouse, its doctors, farms, schools, sports... and the ultimate sacrifice for King and Country. Most chapters are in pairs; the first giving an introduction and perspective (for example hop cultivation), the second, its influence on Beckley, such as hop tokens, pubs and the annual hop-pickers' invasion. The book ends with a conducted walk down Memory Lane (not that we have a Memory Lane in Beckley, you understand!) and easily dismisses the (uninformed) description of Beckley being a "typical Sussex village with little at its beginning, little at its end and precious little in between" Pah! The walk takes us down each lane describing each ancient property, its occupants and their businesses (but please note this work does not attempt to be compendium of family histories - that's for eager genealogists as interpreting the available censuses is difficult enough even for the locals). It also soon becomes self-evident that until the last war Beckley was (almost) self-sufficient from its butchers and bakers (yes, there was reputedly a candle-maker and I am sure the bodgers could turn up a candle-stick); grocers and drapers; cordwainers and cobblers; blacksmiths and wheelwrights; farmers and maltsters; coppicers and charcoal burners... the village even had its own bus company and garage, (see 'The Village bus remembered' on this website) but much has changed and been irretrievably lost within living memory. This has been diligently researched over many years from 15th century Court Rolls, Poll Books, Church records, 19th century tithe maps, 25" Ordnance survey maps, census records, parish records and personal interviews with many village elders sadly no longer with us. It's history is (nearly) all here for clearly no history is ever 100% complete or accurate as each one of us recalls (or has been told) a different version of the same event - indeed, what is truth? So, the research continues with each new revelation (and re-interpretation!) as memories are jogged, adding to this ongoing project. This book is printed in small batches and was first released to the Beckley History Society. £6 from the proceeds of each sale will go to the Beckley Village Fund, a registered charity, for the maintenance of the village War Memorial. We will remember them. "Beckley - a Sussex village"
Part Two: 'A walk down Memory Lane', describing its businesses and people. A significant donation from the book will go to the Beckley Fund, a registered charity, for the maintenance of the Beckley War Memorial.